In the popularity stakes, Tchaikovsky’s Violin Concerto seems to be doing very well lately. Certainly from the performance side, anyway. The other night I happened to catch it on TV as the musical centrepiece of Radu Mihaileanu’s 2010 film The Concert – watered-down, of course. It could also be said that the work is a calling-card for violinists from Korea, not least Kyung Wha Chung in earlier days, and now we have two new recordings from Moonkyung Lee and Jennifer Koh. While Koh is American-born, her parents are Korean. There seems as well to be a gender preference for this suite of Tchaikovsky works, with Julia Fischer’s 2006 Pentatone release (review ~ review) also in the mix. Fischer and Koh play all the same pieces, though Fischer plays the original Op. 42 with piano accompaniment, while Koh plays the Glazunov-orchestrated version. Lee omits the Op. 34 Valse-Scherzo and provides only the Méditation from Op. 42, also in the Glazunov orchestration. 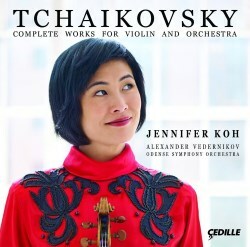 Koh’s disc is sub-titled ‘Complete Works for Violin and Orchestra’, which rather presumes Tchaikovsky would have embraced Glazunov’s ministrations! Comparisons are indeed odious when it comes to releases of this kind, such are the number of variables. The unassailable truth is that Koh offers more content, but from there things get much more subjective, so I will try to provide some guidance. While neither soloist lacks for technique, I found Koh’s playing rather cool and detached. This was apparent from the opening Sérénade mélancolique, which did not bode well for the concerto. Lee sounds more involved, passionate even, in what she’s doing, while keeping a firm grip on the musical elements. Perhaps it’s her stronger vibrato that conveys this impression, but I found her concerto the more engrossing experience. I listened to Koh more with objective appreciation, the defining qualities being delicacy, precision and grace. Both, to an extent, are hampered by their musical and technical support. Koh is caught rather closely and drily, with the orchestra receding into a voluminous space behind her. This only exacerbates the sense of detachment. Lee sounds better integrated with the orchestra, but in a studio environment where the acoustic is enhanced, or so it appears, by artificial reverberation. Neither orchestral accompaniment ever rises above the serviceable, and whether that lies with Messrs Vaupotić and Vedernikov, or the exigencies of modern recording practice, I can only guess – but either way I can’t help feeling both soloists were a little short-changed. While Lee has the London Symphony Orchestra, as does Kyung Wha Chung with André Previn, the close-miked sound and session photos suggest this is the LSO-lite, in session mode, frisson-free. When it comes to Julia Fischer for this programme, I’m afraid things get so much better. Some may find exaggeration in her rubato and moments of indifference from her accompanists, but it’s a performance that breathes a Tchaikovskian spirit so collectively absent from the current pair. Sonically also, Fischer is beautifully integrated into the musical canvas. With the concerto itself, and at last count 66 recordings listed on the Musicweb International Masterwork Index, something extra special is needed, and it’s not to be had here. 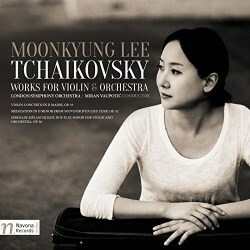 Perhaps Moonkyung Lee with a full and fully-engaged LSO – but that’s only hypothesising. Among the company mentioned in this review, it has to be Kyung Wha Chung, foremost with the LSO and Previn, otherwise with the Montreal Symphony Orchestra under Charles Dutoit. Tchaikovsky twice played well, yes, but competitive in such a crowded field? Not really.